Arab Resource and Organizing Center | March and Rally SUNDAY 3pm! All Out for Palestine on Sunday! Our community power is disrupting Israeli business as usual. Our strength is challenging US-Israeli repression. The Israeli Zim ship is on the run, but we are closely tracking the ship. And based on our calculations, the Zim Beijing cannot make it this weekend, but it could change course and arrive this week. Let’s show Zim what they can expect if they try to come back. Let’s show the world that the Bay Area says no to Zionism. We are calling on all to join us on Sunday and take a stand to stop the US and Israeli relationship, their wars, militarization and repression by disrupting international commerce. Lets make sure Zim knows it will be met with the strength of our sustained movement should it attempt to come this week. As we mobilize at the Port, Block the Boat protests are being planned all over North America with solidarity actions taking place in New York, Long Beach, Tacoma and Vancouver. ALL OUT on Sunday to show our strength and to remind Zim that Israeli business is not welcome on the West coast! Please spread the word. This summer, we made history at the Port of Oakland when we stopped the Israeli-owned shipping company Zim from unloading its goods for four straight days. The blockade was a catalyst for cities all over the U.S. and across the globe in the ever-growing BDS movement to resist Zionism and end Israeli apartheid. The military assault on Gaza—which killed more than 2,200 Palestinians and left more than 100,000 homeless—has halted, thanks to the Palestinian resistance, but our struggle is not over. With the full support of the U.S. government, Israel continues to carry out its brutal occupation, confiscate more land and build more settlements, imprison thousands of Palestinians, and maintain the siege on Gaza as part of its policy of ethnic cleansing. Why Block Zim at the Ports? ZIM shipping line transported weapons and European settlers from as far back as1948, playing a central role in the creation of the state of Israel and ethnic cleansing of Palestine. Now it’s responsible for shipping Israeli ammunition used on poor, black and brown communities all across the US. One-third owned by the Israeli government, Zim fuels a significant portion of Israel’s economy. Challenging Zim cuts a lifeline of Israeli colonialism and exposes the strength of US-Israeli ties. We built on that legacy at the Port of Oakland in 2010, after a Turkish flotilla, the Mavi Marmara, was attacked by Israel for attempting to bring humanitarian aid to Gaza, by successfully blocking a Zim ship from being unloaded—the first time in US history an Israeli ship was blocked. And recently, we made history again with the 2014 Block the Boat campaign, stopping Zim and Zionism and the port of Oakland for four consecutive days. Just as apartheid fell in South Africa, so too it will fall in Israel! Israel was defeated by the resistance and resilience of the people of Gaza. We are inspired as they rebuild and continue to affirm life in the aftermath of Israel’s latest bombardment. Palestinian resistance did not begin with Israel’s latest bombardment—it has been going on since 1948, since Israel came into existence. And it will not cease until Israeli apartheid falls. It is now more important than ever to continue to weaken the racist state of Israel and bring down apartheid. Palestinians are unified in their call to people around the world to take action against Israel everywhere. Bay Area residents have the opportunity to up the ante and be leaders in the movement for justice in Palestine! We salute the longshoreman who stood with the Palestinian people by honoring our Block the Boat picket and refusing to unload Zim in August, and for doing so again during another successful picket in September. We will be asking workers to once again join with us in sending a message to the world that Zionism is not welcome at the Port of Oakland. Join us! Join the Movement for Boycott, Divestment and Sanctions! From Oakland to Seattle, Los Angeles, Vancouver, New York, New Orleans, and Tampa—turn the Israeli ship around! 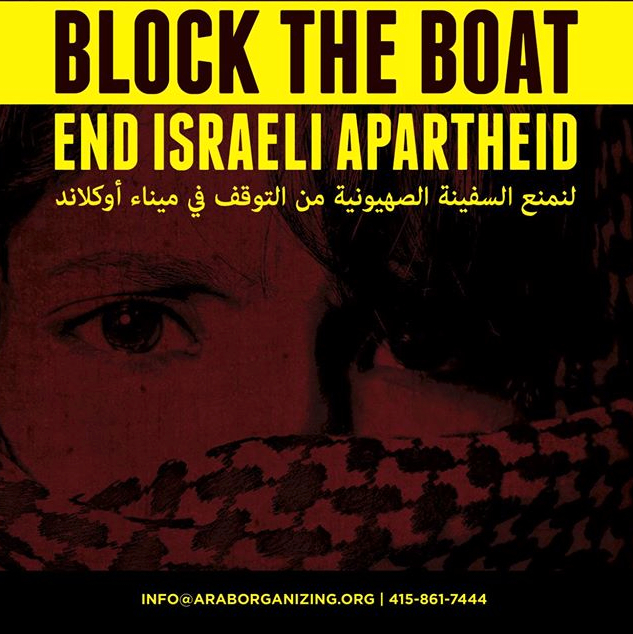 Please email info@araborganizing.org with subject “Endorse Block the Boat” to add your organization.